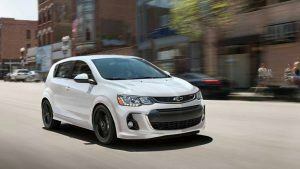 Budds' Chev | Blog | Spark or Sonic: Which to choose? Spark or Sonic: Which to choose? 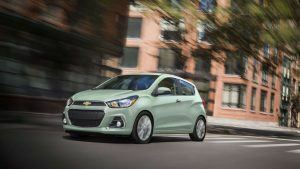 So today we thought we’d take a closer look at the Chevy Spark and it’s (relatively) bigger brother, the Chevy Sonic. Positioned firmly in the subcompact class of passenger vehicles, these are fuel-efficient, easy to park, and most importantly, very safe. This four-door hatchback is just 3.6m long and 1.6m wide. Inside the passenger volume is 2,350 liters and folding down the back seat creates 771 liters of cargo room. Yes, it’s a small car. It’s also a hoot to drive in the city. You’ll find yourself nipping and turning with abandon, squeezing through gaps and easing into parking spaces too small for an SUV. The only thing quicker through traffic is a motorcycle, and seriously, there’s a lot to be said for a roof. And airbags. And a strong safety structure. In the US the Spark gets a top rating from the IIHS for front overlap and side impact tests. The NHTSA gives it four stars out of five because, well, physics. It is a very small car. That said, it comes with 10 airbags and a rearview camera. Beneath the perky, sloping hood you’ll find a 1.4-litre motor. With the manual transmission this sips gas at a rate of 8.0 L/100Km City and 6.0 on the Highway. Go for the Continuously Variable Transmission (CVT) and those numbers shift to 7.8 and 6.2. In other words, the CVT is slightly more efficient around town, which is really where the Spark belongs. The Spark comes in three trims: LS, 1LT and 2LT. The 1LT gets a/c and power windows while the 2LT is blessed with goodies like push-button start and a leather-wrapped steering wheel. LS trim is admittedly more basic. Remember, though, that it’s aimed at someone who wants new car benefits—warranty, reliability, modern safety features and great economy—without spending much money. After test driving the Spark, (and you really should,) the Sonic is going to feel like a big car. It is a bit bigger, and gives you more choices plus an interior that’s plusher than most competitors. First off, it comes in both hatchback and sedan styles. The hatchback is shorter—4.1m versus 4.4m—and offers up to 1,351 liters of cargo room while the sedan has a 422-litre trunk. Being longer and wider, the Sonic offers noticeably more passenger room at 2,557 litres, making this car good for transporting your four hockey-playing friends. Safety-wise, those friends will be happy to know the Sonic gets five stars from the NHTSA and top ratings from the IIHS for overlap and side impact tests. As with the Spark, 10 airbags and a rearview camera are standard. The available trims are LT and Premier, although only the hatch is available in the latter. LT’s come with a 1.8-litre engine that delivers 9.3 and 7.0 L/100Km City/Highway respectively, with the auto transmission. Premium trim earns a 1.4-litre turbo rated at 8.8 and 6.3 L/100Km. LT trim also qualifies for 15” wheels while Premium comes with 18’s. An available RS package gives the LT cool 16” rims. All Sonics get LED daylight running lights and if you want to have fun with your friends, ask them to find the rear door handles. Cleverly hidden in the rear window surround, these disguise the rear doors to create something of a coupe appearance. No one would ever call the Spark and Sonic family cars. The Spark is definitely best used as a city runabout for one or two people. The Sonic, however, would be perfectly adequate on longer journeys. If you wanted a little more interior room though, the Chevy Cruze hatchback is the obvious next step. Interested yourself in minimalist motoring? Come to Budds’ Chevrolet Cadillac Buick GMC and see for yourself how good these tiny cars really are.